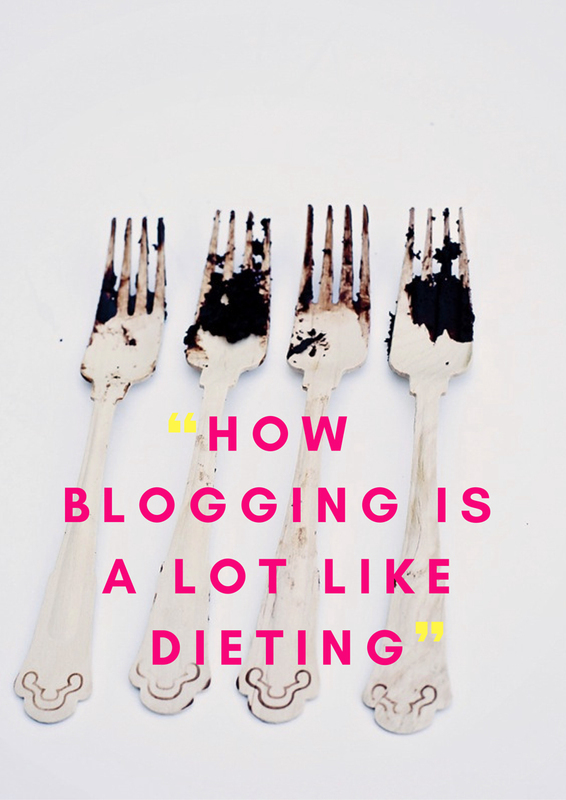 In almost every class I teach, I tend to start with some version of this statement: blogging is a lot like dieting– don’t you think? Here is what I mean: there are classes, blogs, conferences, books, consults to be had- All to share the secrets to building a successful and profitable blog. It’s becoming a big industry these days. And to be honest, it is amazing. To share what you love everyday, work your own schedule, and make a great living from it- well, that is pretty special. I love getting to teach others how to do it. That being said, blogging is not all sunshine and daisies. When it comes down to it, the real secret to building a blog is the same as the real secret to dieting. After you read all the books and hear all the success stories – it comes down to the daily effort of putting down the brownie and putting on the running shoes. Blogging as a business is A LOT of work. It is a daily commitment to making it happen. Saying no to immediate sweeter uses of your time and putting in the hard work; pound after pound, day after day. And just like dieting, it is always worth it in the end. When you reach that place where your site is what you once envision it to be – it is so very worth it. Want to learn more how to monetize that site you’ve spent so long creating? Join me for our newest course release! Land that Brand – Exponentially grow your blogging income in the next 30 days. So true, also when you blog as a hobby not as a full-time job. If you want to do a quality job, you just gotta do it. Giulia, totally! I think it is sometimes the most difficult at the beginning when blogging isn’t paying the bills because other more important things can take up so much time and energy. I had many seasons when I wanted to just stop blogging, but I am happy now that I stayed moving forward- even if it was slow at times. I can’t wait to read more from the series! This is great Victoria! I just chatted with a friend today who just started a blog and he was mentioning how surprised he was that it’s a lot of work. YEP! I’m thankful for your hard work!! You nailed it! And after you come in from you run, and unlace your shoes, you feel so good and wonder why you didn’t take up running sooner :) Great post! I cannot agree more, it takes will power and self discipline to go on. Can’t wait to hear what you have more to say in this series. thank you so much for this post, we cant wait to read more of your insight! We’ve been thinking so much about this lately ;) thanks so much vicky….your blog is amazing! We remember when we first started following you forever ago, you have done an AMAZING job with it and you always provide so much inspiration!! I totally remember:) I posted your Paris Party way back when. Glad to know you are still working at it- the site looks beautiful! This is so true! I have never thought of it like that before but, I happen to struggle with both!